I am really (super, duper!) excited about Goal #3 for 2013: to do Project Life. I started 2012 with a similar goal. But I didn’t get very far. That’s right. I set a goal and I didn’t achieve it. It’s okay. It happens all the time. When it’s a goal you really want to make happen, you simply try again. But, when you try the same goal for a second or third time, it makes sense to try a different approach. To do the same thing over and over again and expect a different result has been called the definition of insanity. And since my word for 2013 is happy—not insanity—I’m going to try something different to make Project Life 2013 a reality this time around. One thing I know for sure is that the desire to achieve a goal has to be much stronger than the obstacles that will (inevitably) get in the way of that goal. It has been said that “where there’s a will there’s a way.” I think the reverse is true as well. When the will to do something isn’t very strong, it can be really hard to find the way. So step one, for me, is to really dig deep and understand why I want to do this. What is this project really about for me? His passing made me realize so many things. One of those revelations is that you just don’t know when you’ll no longer have the chance to do that important project you always think you’ll have time for later…like next month or next year or whenever. You have to make the time for the people and projects that are most important to you. You have to make time…now. What’s more, when my Dad passed away I realized on a whole new level how important pictures really are to me. I always knew…but now I really know. I have experienced their importance in a whole new way. 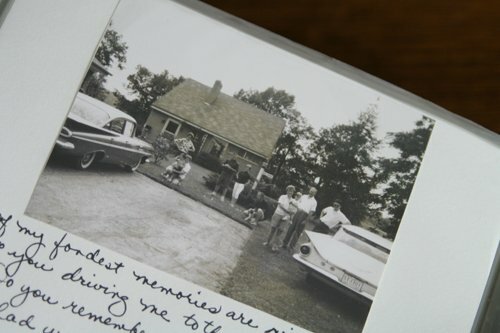 In the days right after my Dad died, my brother, sister and I spent hours sifting through boxes of old pictures and leafing through old photo albums. We printed recent digital photos off of our laptops. And we put our favorites all together on photo boards for his visitation. That process was incredibly healing. I always thought those photo boards were for the people attending the visitation—so they could gain new insight into their friend’s or loved one’s life. And perhaps that is part of it. But I also believe it’s a secret form of therapy for the family members closest to the one who was lost. Putting those boards together is the only time I can remember, in my entire adult life, that my two siblings and I were together as just the three of us. No spouses, no kids…just the three original “Peterson kids” going through old photos, remembering our dad, and beginning to heal. What would we have done if there hadn’t been any photos? We took the photo boards and the scrapbook I made for my Dad’s 70th birthday to his visitation. 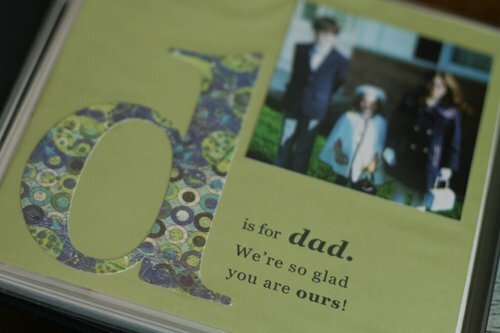 That 70th birthday scrapbook was called Your Life from A to Z. My brother and sister helped me pull that project together, just six years earlier. We came up with something meaningful in my dad’s life for each letter of the alphabet. We collected and scanned and printed old photos. We wrote stories for each letter of his life. We gathered photos and letters from my Dad’s family members including his two brothers and several of his cousins. 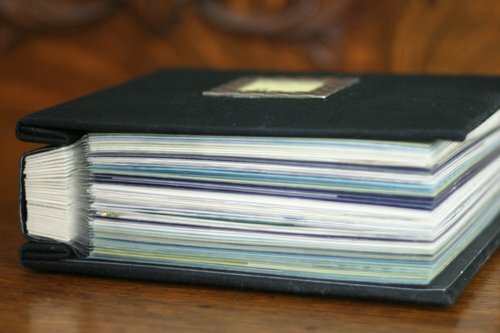 I took on the task of compiling my Dad’s “life” into a little six inch by six inch scrapbook. “Now I get it,” he added. Photos, stories, memories…they matter. More than I ever knew before. And that’s why I’m doing Project Life in 2013. How about you? Are you doing Project Life in 2013? What’s your motivation for doing it? I’d love to hear from you. P.S. In an upcoming post (or two) I’ll be sharing my new approach and how I’m getting myself organized for Project Life 2013. Check back soon. My desire to document the day to day also stems from loss. My mom died very suddenly in 2011 when I was 28yo. After she passed one of the first things I so longed for was to know more about my mom when she was younger and some of her most cherished memories. While I have not yet found the strength to create a memorial album for her, I have found the motivation to document the stories of my own family. In 2012 I got through jan-June in our PL album, seeing as that was the longest I have ever stuck with a project I am very pleased. This year I am keeping it much simpler with only the kit and some stamps and not forcing myself to do 2-page spreads each week. Our 2nd is due in April and I hope to use Pl as both a family and baby album. Very grateful for this new way of memory-keeping. Thanks for sharing your thoughts Marina. I’m so sorry that you lost your Mom at such a young age. That must have been incredibly difficult. You will be able to do that memorial album when the time is right for you. Congrats on your new baby and good luck with Project Life 2013. I’m definitely focused on keeping it simple, too. Love this! Got me all weepy. I started PL in 2012 because I was having baby 2 and knew I wouldn’t be able to do a dedicated baby book the way I did for baby 1. I am totally addicted to project life, I love capturing the random things my girls do and seeing their growth and change over a year. I love how I captured all the little moments with them. And as a working mom with 2 kids, project life allows me to have a creative outlet, with out the pressure and time spent on traditional layouts. I feel caught up. Plus there are so many little moments with small children that are not entire scrapbook page worthy but fit just great on a 3×4 card. I am now going back and retro doing our 2011 year. So motivation is my girls. And I will probably do this for the next 4 years until they start school, then I’ll switch to separate school albums for them. We shall see! Thanks, Alissa! Oh how I wish there had been Project Life when my kiddos were babies and toddlers…that would have been sooo cool. Great motivation to do it! This is my 4th year of doing Project Life. My album isn’t fancy, but it’s current. I print pictures weekly at home, not necessarily one from each day, it depends on the weeks activities or if a certain story needs to be included. My journaling is done daily or every few days. I keep my album on my coffee table so it can be looked at as well as updated easily. My supplies are in a basket underneath the table. My kids have grown so fast, I don’t want to feel like I blinked and missed anything. Thanks, Kelly. Sounds like you have a great system. And I love that you keep your album on your coffee table. I don’t have a coffee table in my family room (which is where I’m setting up to do Project Life) but…I’m going to find a spot for my album in the family room. Thanks for the idea! I’m so sorry about your Dad SuzieQ. What a lovely idea to document the time you have together with him. I do wish I had done that. 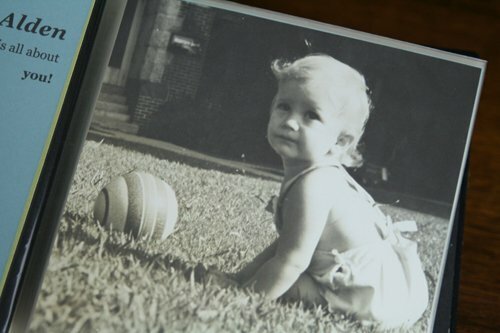 While, I chose a traditional approach, I have also used scrapbooking as a way of healing. I was never been able to scrap about my mom (who died about 8 years ago). It was way too painful. Until after my dad died. Ironically, it was with my dad’s death (2 years ago) that I was finally able to find some healing with everything that happened to my mom. And I was finally able to start on a memorial book for her. So… in a nutshell it went like this for me… my dad’s death helped me heal from my mom’s death. But scrapbooking about my mom helped me heal from my dad’s death. As far as PL goes… I use the PL-style to do the albums for my nieces and nephews. When my youngest nephew goes into Kindergarten, I’m turning over all my PL stuff to my sister so she can do her own scrapbooking. PL was designed for people like her! Thanks Shannon. I’m so glad to hear that you have been able to heal from both of your parent’s deaths, and how awesome that scrapbooking played a part in that. This all sounds so interesting but I don’t really understand what Project Life is. Where can I read more about it? I guess i’m confused about it, is Project Life a company or is that what you have termed your goal of documenting the year? Sorry I’m a little behind on this :). What a sweet idea to do about your dad! That is truly a treasure. I’ve just ordered my first Project life kit. I am taking a different approach. I see it as a quick, easy yet beautiful way to catch up on all they ears of digital photos stored on my computer. I’m excited to bring the past to life.